FUCheese » Oregon Cheese Festival This Weekend! Oregon Cheese Festival This Weekend! 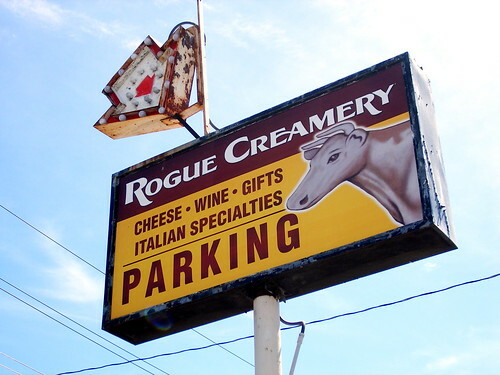 This will be the second year FUCheese travels down to Central Point for the Oregon Cheese Guild Cheese Festival hosted by Rogue Creamery. This year, we’re going to try to hold back a little bit and not eat the whole thing! We’ll be staying in Ashland so if you have any “don’t miss” restaurants or things to see, please comment! I’m hoping to attend more of the workshops this year and am looking forward to meeting Gordon Edgar and getting a signed copy of his memoir, Cheesemonger: A Life on the Wedge . Tami Parr wrote up an excellent review of his book and I can’t wait to get my hands on it. Amanda, I found this place on yelp that sounded pretty good for breakfast either Sat or Sun. I bet there are cool places in Ashland too.